“Why does the world exist?” is one of the most fundamental questions about life. It may be a clue to deep truths about life and perhaps about God. And it can make all but the most ardent theist squirm for lack of a satisfactory answer. 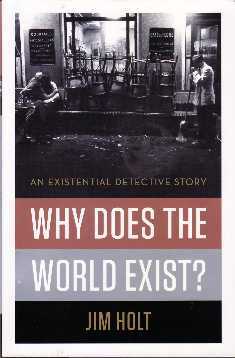 “Why does the world exist?” is also a book which was deservedly included in the New York Times “10 Best Books of 2012“. For it examines this difficult but important question with wit and vigour, and in a deep but easy-to-read manner. I really enjoyed it. Yet in the end it is inconsistent and inaccurate. So how can it be so good? The idea of nothing and infinity in philosophy, science and mathematics. The question “Why something rather than nothing?” is meaningless, it doesn’t even makes sense (philosopher of science Adolf Grunbaum). How the existence of God explains why there is something rather than nothing better than anything else (philosopher Richard Swinburne). We may one day develop a final scientific ‘theory of everything’, but that would still not explain why that theory and not some other (physicist Stephen Weinberg). Plato’s idea that there must be an ideal, eternal and perfect ‘world’ of mathematics beyond this one, makes our physical world possible, perhaps even necessary (mathematician Roger Penrose). The universe came into being because a possibility that is good ‘ought’ to exist. Thus the cosmos consists of an infinite number of infinite minds which know everything, including the structure of our universe (philosopher John Leslie). There are a large number of possible realities, and a ‘Selector’ chooses which reality actually is (philosopher Derek Parfit). We cannot trust mathematical science without faith, and faith might just as well believe God did it (novelist John Updike). Since the atoms of our brains and bodies are continually being replaced is there any identifiable “self” that exists? Between these interviews, Holt calls on the thinking of famous names like Plato, Hume, Kant, Leibniz, Heidegger, Wittgenstein, Russell, Hawking and many others. Also prominent is the Cafe de Flore in Paris where Sartre wrote, and Holt visits and re-visits. It might sound all very theoretical, but Holt’s skill as a journalist makes it a cosmic “existential detective story” that moves along and always retains interest. As you may discern from the list of topics, Holt tells a story as he eliminates possibilities. He starts with the obvious candidates for an explanation for the existence of the universe – God or science. He disposes of God very quickly (“So the God hypothesis – even if it is accepted as more probable than the alternative, that of a complex universe which exists uncaused – does not fully resolve the mystery of existence.”). But it isn’t long before he has concluded that science cannot provide an ultimate explanation either (“My encounter with Weinberg …. left me in agreement with him that no such [scientific] explanation could dispel the mystery of existence.”). So Holt’s quest goes on to examine what most of us would find rather bizarre – philosophical speculations that some metaphysical or logical truth makes the universe inevitable, without ever being able to explain in any understandable way (to me, at any rate) how this might actually happen. Holt comes up with a “proof” that he believes (if I understand it correctly) shows that (a) there must be something rather than nothing, (b) there is only one possible explanation of reality and (c) reality must be mediocre, somewhere between the richest of all possible worlds and nothing. But there’s no explanation of how this happens, only a “proof” that is hard to believe and a set of assumptions that seem almost mystical (in the same way that Parfit’s and Leslie’s speculations seem mystical and unreal). Now to what seems to me to be the glaring inconsistency in his detective story. Near the beginning, he rules out God as the explanation because we cannot know the explanation for God’s existence, but then entertains possibilities that similarly cannot be ultimate explanations. Even his final “proof” does the same. So if all the explanations cannot be final ones, then all of them fail in the same way. God is, on Holt’s terms, actually no less likely than any other explanation. It’s just that he rejects that hypothesis early on, and doesn’t go back to re-visit it when his other options also fail. Moreover, many of the more speculative hypotheses look very much like God with the word “God” removed. My personal conclusion from this marvellously interesting book is that the conclusion that God is the explanation for the universe is reinforced. None of the other hypotheses stand up nearly so well. God explains everything except himself and we can understand why we cannot understand God. No other hypothesis comes close to being as convincing or explaining so much. I need to think about this more, but I intend to post further on these matters. Meanwhile, I recommend the book for all interested in the question: Why is there something rather than nothing?